Paul McCartney's ninth solo studio album was recorded in the wake of his extensive 1989-1990 world tour, and saw him record with a band for the first time since Wings' 1979 album Back To The Egg. It was also the studio follow-up to the critically acclaimed Flowers In The Dirt, McCartney's 1989 album which was widely considered to be a return to form. In between the two releases he also issued the live albums Tripping The Live Fantastic and Unplugged: The Official Bootleg, and his first foray into classical music, 1991's Liverpool Oratorio. Work on Off The Ground began in 1991, when McCartney recorded demos of several unfinished songs on a Sony Walkman. Previously he had made often elaborate recordings for session musicians to learn their parts from, but the 1991 demos were deliberately basic, to allow his band freedom to add their own ideas. The nice thing about this band is they're all good players, so we can make a good little noise just with the six of us. That was the idea: to do a simple little band album rather than anything very produced or complicated. In contrast to his open attitude towards the music, McCartney made extra effort with the lyrics, perhaps in response to criticism that his previous solo works tended to lack depth or err towards trite sentiments. To that end he enlisted the help of poet Adrian Mitchell. When I came to do this album one of the things I thought was that it might be good to be a little less casual and make sure I'd done my homework, make sure I liked all of the words in the songs. So I got a friend of mine, a poet called Adrian Mitchell, to look through the lyrics as if he was an English teacher. I went through it all with him and I can now say that they're poet-proof. The album also featured two collaborations with Elvis Costello, Mistress And Maid and The Lovers That Never Were; the latter was the first song they wrote together. The pair had previously collaborated on Flowers In The Dirt and Costello's Mighty Like A Rose album, but Off The Ground saw the final fruits of their partnership. 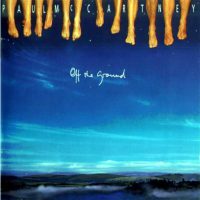 Off The Ground contained some lyrical themes that revealed McCartney's preoccupations at the time. Looking For Changes was an anti-vivisection protest. Animal rights also figured in the lyrics of Long Leather Coat, a b-side on the lead single Hope Of Deliverance. I thought, I'm coming up to 50, not much point in trying to be cutesy. So what do I really think about, what do I do, what do I spend my time on? Well, Friends Of The Earth, Peta, vegetarianism – how the world would be a much better place and be able to feed itself a lot better if we stopped eating meat. C'mon People took a stand against the Thatcher-Reagan right-wing politics of the previous decade. That theme was continued on the Hope Of Deliverance b-side Big Boys Bickering, which contained a rare expletive to forcefully get his point across. Peace In The Neighbourhood and Golden Earth Girl combined his love of family and nature. Winedark Open Sea and the closing hidden track Cosmically Conscious – written in India in 1968 – developed the themes further, delving deep into spirituality, while lead single Hope Of Deliverance spoke of salvation through the power of love. Biker like an Icon actually was released as single in some countries. There are both 2 and 4 track versions of the issue; backed by the Unplugged versions of Things we said today and The Midnight Special as well as the Paul is Live version of BLAI. The Unplugged version of Mean Woman Blues, mentioned in the article, never saw a commersial release. Off The Ground is one the (if not The) most underrated albums ever. It is the best album Paul did since Tug Of War IMO. A collection of strong, beautiful, and inspiring songs. (Just ask Coldplay). Just to mention a few – I Owe It All To You, The Lovers That Never Were, and especially Mistress And Maid, even only for the sake it’s my Dad’s favorite off the album. And Golden Earth Girl. Beautiful, touching songs.. I really like this album, too. The songs you list here are all great (“I Owe It All to You” has a particularly sumptuous chorus) – and I happen to adore the title track. It never fails to lift my spirits. “Winedark Open Sea” is beautiful, too. What a gorgeous image the title alone conjures. What is Golden Earth Girl all about – the verses make some sense and are lovely but the chorus has me baffled – “eggshell finish”? etc.